Cathay Pacific Airways' long-haul growth could provoke Asian airline consolidation; ANA and SIA? Locally in Hong Kong, Cathay Pacific has been in a rotating series of staff disputes with threats of work stoppages. But elsewhere in Asia competitor airlines have cast a worrying glow over Cathay and its long-haul growth. Cathay in Apr-2015 received its 50th 777-300ER; this in contrast to its previous long-haul workhorse, the 747-400, which numbered only 24 at its peak fleet size. Cathay is the only Asian airline to have a significant presence in all three of Asia’s core long-haul markets: Australia, Europe and North America. Europe and North America will receive further growth as A350s arrive, while Australia expansion hinges on gaining added traffic rights. Cathay’s geography in the middle of Asia gives it cross-regional reach lacking at competitors, which are often smaller than Cathay. A likely outcome of these dynamics is the evolution of deep partnerships between Northeast and Southeast Asian airlines. As they further consider endgame scenarios, consolidation becomes a possible future direction. Mergers will not be as integrated as in Europe, let alone North America, but the pressure for some forms of closer relationships is growing. One possible example could be a pairing of All Nippon Airways and Singapore Airlines. Cathay Pacific’s long-haul growth has largely occurred since the latter half of the previous decade. Looking at a 20-year summary of Cathay’s long-haul fleet, the aircraft count was flat between 1996 and 2006, with 1996’s 39 aircraft dipping to 33 after the Asian financial crisis, before building up to 40 in 2006. Over the next decade this grew to 63 long-haul aircraft, all due to new 777-300ERs arriving. Cathay received its first 777-300ER in 2007 and will take delivery of its 53rd (and last) 777-300ER later in 2015. In 2014, Cathay’s 777-300ER fleet size – 47 – surpassed the total number of all long-haul aircraft types the carrier had ever operated before. Measuring long-haul aircraft fleets is naturally imprecise; in recent times A340-300s and 747-400s have been withdrawn from long-haul routes and used regionally. This fleet measurement excludes growth in A330s, which almost exclusively serve the medium/long-haul market of Australia. They also serve smaller medium/long-haul markets including the Middle East and South Asia. Cathay in Mar-2015 forecast it would end the year with 63 long-haul aircraft, 53 777-300ERs, three 747-400s and seven A340-300s. For the rest of this decade, Cathay’s long-haul growth is planned to be with A350s: 22 A350-900s and 26 A350-1000s. The A350-900s are due to arrive in 2016 and 2017 while the A350-1000s are due to arrive between 2018 and 2020, after which Cathay will take 21 777-9Xs. The A350s will not have immediate replacement priorities as the 747s have been withdrawn from long-haul use and the A340-300s do only very limited long-haul flying. As such, the A350s will bring in significant net growth on the long-haul network and some replacement of regional flying. Cathay in Mar-2015 noted it had 23 777-300ERs on sale and leaseback, giving it the flexibility to hand aircraft back if market conditions prove not strong enough to support net growth with A350s. Cathay's accounts state two 777-300ER leases expire in each of 2017 and 2018, but the bulk (19) expire in 2020 or beyond. That means Cathay is well committed to net growth through at least until the end of the decade. Re-leasing of 777-300ERs has been uncommon so far. If lessors find it difficult to re-position the aircraft (mostly due to customised interiors), they may offer discounted renewal rates, making it cost effective for airlines to continue to operate the type. As CAPA has previously noted, A350s are expected to replace 777-300ERs on certain destinations and flight times, but this would allow for 777-300ERs to be re-deployed and still bring net growth beyond levels that are already causing concern to some of its competitors. Cathay is unique amongst Asian airlines for being strong in Asia’s three core long-haul markets: Australia/New Zealand, Europe and North America. This is largely due to its geography – and modern aircraft – enabling access to these key markets. Between 2005 and 2015, there were a number of big changes in the Asia-Southwest Pacific market. Qantas went from being the largest to second-largest, but a more holistic view might be to view the Qantas Group in 2005 (Qantas and Australian Airlines) and 2015 (Qantas and Jetstar). While Qantas mainline has decreased in size, its lower-cost unit has grown. Singapore Airlines as a group would be larger in 2015 when including low-cost Scoot and full-service subsidiary Silk Air. 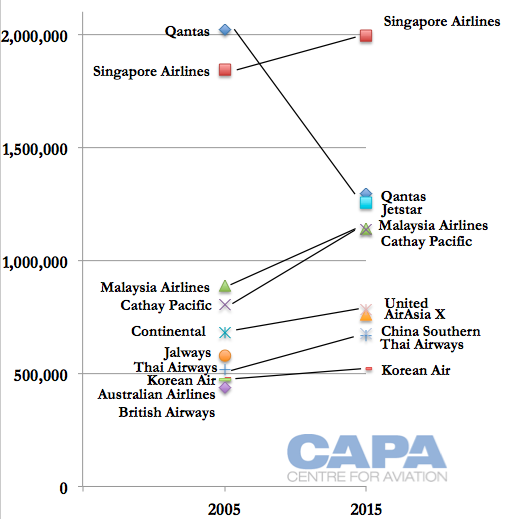 Malaysia Airlines and Cathay Pacific have both grown while Thai Airways and Korean Air have shown more moderate growth. JAL and British Airways are no longer in the top 10; in their place AirAsia X and China Southern have entered the rankings and moved up. Note: Continental/United capacity is from Asia to Pacific islands, included in the Southwest Pacific category. Although Cathay has not made significant leaps in rankings, competitors see a few factors for concern. First is that Cathay has not lost ground. Malaysia Airlines and Thai Airways have lost their stronghold in Europe while JAL and Korean Air have done so to North America. Second is seeing Cathay will grow more and be able to offer a comprehensive network around and to/from Asia. To Europe and Australia/New Zealand, Singapore Airlines is significantly bigger than Cathay, having 27% more seats to Europe and 76% more to Australia/New Zealand. 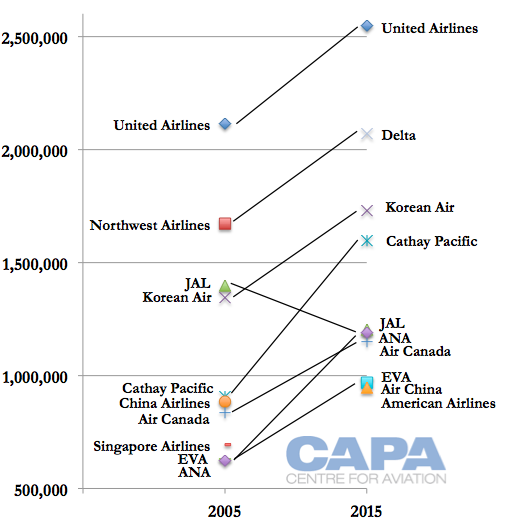 SIA is not an exact competitor to Cathay given different source markets, but comparing the two, SIA’s large omission is North America, which it cannot serve non-stop profitably. That makes it dependent on securing stopover rights, which it has found difficult to obtain. In the Asia-Europe market, leader Lufthansa has grown while Singapore Airlines has replaced Thai Airways as second largest; meanwhile Air France has replaced British Airways as third largest. Malaysia Airlines, Japan Airlines and Qantas are no longer on the ranking, replaced by Turkish Airlines, Air China and Finnair. Turkish Airlines has made a rapid ascent; in 2015 it is the fourth largest airline between Europe and Asia. Air China has also moved quickly and is seventh largest. Thai Airways can be expected to decrease European capacity, with plans to consolidate London Heathrow operations from two to one daily flight. Although no longer ranked, Malaysia Airlines in May-2015 ended Frankfurt-Kuala Lumpur services. Cathay’s long-haul jewel is likely North America. Gulf carriers have significantly grown in the Europe-Asia market, and particularly in Southeast Asia, impacting MAS, SIA and Thai. Australia is experiencing low-cost competition as well as a large and growing presence from China Southern, carrying large volumes of Chinese on holidays. North America in comparison has no Gulf carrier competition and, unlike Australia, has strong corporate demand. North American carriers are often perceived as inferior to Asian carriers, whereas in the Europe-Asia market European airlines carry a stronger reputation than their North American counterparts. Cathay’s strength in North America becomes a threat to those smaller than it. 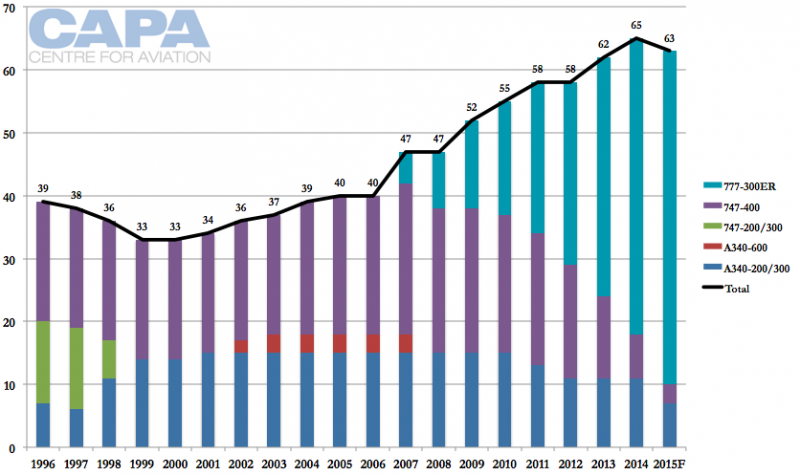 In the Asia-North America market, United and Northwest/Delta remain the largest carriers. JAL has shrunk while China Airlines and Singapore Airlines no longer rank. They have been replaced by Air China and American Airlines. 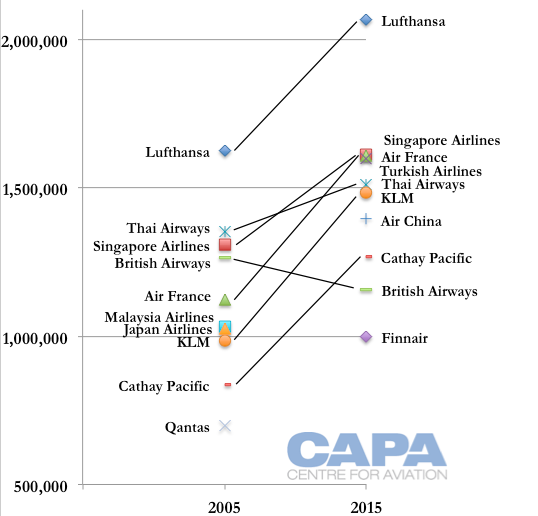 Cathay's growth has been steep. Cathay appears eager to go it alone; its cross-shareholding with Air China has produced exceptionally limited network synergies. Cathay’s strength in mainland China may allow a more independent mindset – for now. North America is seeing further increases from Cathay in 2015 after large growth in 2014. The next long-haul target is Europe, and there is seemingly a never-ending list of speculative destinations Cathay plans to open. This includes Tel Aviv and either Sao Paulo or Rio de Janeiro. The shift at Asian airline some strategic planning in recent times is recognising Asia is a large continent and really comprised of many smaller markets. Tokyo and Singapore/Jakarta are about as far away from each other as New York and London, which are covered under extensive joint-ventures. That city-pair was important enough to be a leading reason for Delta to take a 49% shareholding in Virgin Atlantic. Yet cooperation between Northeast and Southeast Asian airlines is exceptionally limited. This is perhaps surprising since the individual markets are more nuanced with customer demands and booking preferences, specifics partners could learn about from each other. Probably the greatest partnership circle is the one around Bangkok Airways, which essentially receives passengers from airlines for onward carriage to smaller Thai markets or boutique regional destinations. This is a mostly one way partnership model. Of two way partnerships, the examples are relatively recent. Singapore Airlines has partnered, slowly and steadily, with Asiana and EVA Air in hopes of expanding its virtual North American footprint. All Nippon Airways and Garuda have also partnered to cover smaller cities in their respective domestic networks. ANA only serves Jakarta in Indonesia while Garuda serves only Osaka and Tokyo in Japan. In comparison, Cathay (with is Dragonair unit) serve additional cities in both Indonesia and Japan. The stitching together of Asia’s markets has arguably seen the most – but not yet overwhelming – success from LCCs. AirAsia and Jetstar have franchises in or planned to be in both Northeast and Southeast Asia. Others like Lion, Scoot and VietJet have franchises within Southeast Asia, often flying to other markets. In recent years cooperation has occurred at a group level, for example AirAsia X (Malaysia) to Thai AirAsia or Scoot to Tigerair. The next evolution, and probably not far off, is working outside a grouping. Many LCCs have expressed interest but consummations are limited (Jetstar receives transfer passengers from carriers including Emirates). Talks between SIA and Jeju Air could indicate broader cooperation will be occurring, even if that goes nowhere. In this environment it is admittedly a leap of faith to talk of consolidation and mergers. And that is only from a strategic level; government ownership constraints still generally prohibit outright trans-border mergers. But the pressures are mounting, if not for consolidation, then for retaliatory partnerships; some carriers will see marriage as a pre-emptive block to possible threats, such as from Cathay's growing strength. The actual value of a pairing would be limited initially. Network overlaps abound and synergies would be limited, and Asia’s non-focus on return on capital (unlike Europe and North America) takes the accelerator off achieving a “successful” merger. The logical pairings are between carriers in the extremes of the regions, combining a Southeast Asian backyard with that of Northeast Asia. Very much a focus would be the accompanying long-haul markets: North America for a Northeast Asian carrier, and for a Southeast Asian carrier, Australia and perhaps Europe. A deep partnership between All Nippon Airways and Singapore Airlines thus becomes interesting; the two have good relations, SIA wants North American access and ANA is flush with funds to invest in growth markets. Before any such marriage, there is room for proxy dalliances between the growing LCC brands at both ANA and SIA. There is however a danger to rushing into partnerships and mergers that may not deliver significant benefits. They could for example preclude future opportunities, with many dynamics to change when Chinese airlines are one day free to participate in consolidation, as SIA and China Eastern tried last decade. Overall however, the matchmaking is not yet ideal. MAS and Thai Airways are undergoing restructurings while other carriers do not have the mindset for ambitious partnerships. Many low-level partnership opportunities remain on the table. But it would only take one consolidation move to project everyone else on a learning curve. Asia’s airlines have to ask if they want to shape the future or be shaped by it.